You'll be £20.00 closer to your next £10.00 credit when you purchase Russian Warships in the Age of Sail 1696-1860. What's this? This major new reference work handsomely fills this gap, with a complete and comprehensive list of the fleet, with technical detail and career highlights for every ship, down to small craft. However, because the subject is so little recorded in English, the book also provides substantial background material on the organisation and administration of the navy, its weapons, personnel and shipbuilding facilities, as well as an outline of Russia’s naval campaigns down to the clash with Britain and France known as the Crimean War. Illustrated with plans, paintings and prints rarely seen outside Russia, it is authoritative, reliable and comprehensive, the culmination of a long collaboration between a Russian naval historian and an American ship enthusiast. EDUARD SOZAEV is an established Russian naval historian with a number of books to his credit. JOHN TREDREA, his translator, editor and long-term collaborator, is an American ship enthusiast with a life-long interest in the Russian navy. This excellent volume from Seaforth is the result of a very effective and fruitful collaboration between a very respected Russian naval historian and an American ship enthusiast. The end product is a comprehensive work that is not only unique in English but remains virtually unrivalled with Russia itself... This fine book will go some way towards completing a very detailed overview of the ships of the sailing navies of Europe. In just one word - this book is SUPERLATIVE!! Most extraordinary mine of information...and for naval interest should most certainly be in your library. The introductory part is generally well organized and contains a wealth of useful information. The book succeeds in making previously hard to access data on the development of the Russian sailing navy accessible to an English-speaking audience. The systematic structure and the idea to combine the catalogue of sailing warships with extensive background information in the introduction add to the attraction of the volume. While Britain's Royal Navy was the most successful navy of the sailing era, the Russian Navy was probably the second best. In terms of victories and achieving national aims it surpassed both the French or Spanish navies. It was the dominant Baltic Sea power. Yet Russia's sailing era achievements are little known in the Anglosphere. This is partially due to geography - France and the Netherlands were neighbors, Russia far away. Language is another barrier, as is the decline of Russia's Navy with the emergence of steam. Russian Warships presents the often-overlooked story of the Russian Navy and its ships in English and in depth. It contains a capsule history of the Russian Navy during the period of the work - a history that seems almost as detailed as those R.C. Anderson's earlier two books on the Russian Navy. Russian Warships also describes the shipbuilding and port facilities of the Russian Navy, including both governmental and private yards. It contains a section of Russian seagoing artillery, including a discussion of edinorogs, a weapon unique to Russia. The heart of the book is the histories and descriptions of the individual warships. Virtually a one-volume Russian version of Dictionary of American Naval Fighting Ships, much of Russian Warships consists of thumbnail descriptions and histories of the classes of warships built and the individual ships within each class. This section is sorted chronologically, geographically and by class. Each period of the Russian Navy is presented, with the sections divided between the Baltic and Black Sea fleets. These sections are the subdivided by ship class - from ships-of-the-line down to the smallest cutter. There are also sections containing ships purchased by the Russian Navy and prizes ships incorporated into the Russian Navy. The data is sometimes limited, but is as comprehensive as the authors could provide. Appendices list orders-of-battles for significant actions and expeditions involving the Russian Navy. The book has a numerous collection of period illustrations as well as numerous line drawings. It is possible for an experienced model-maker to scratch-build models from some of the line drawings, but this is not a task for a beginner. 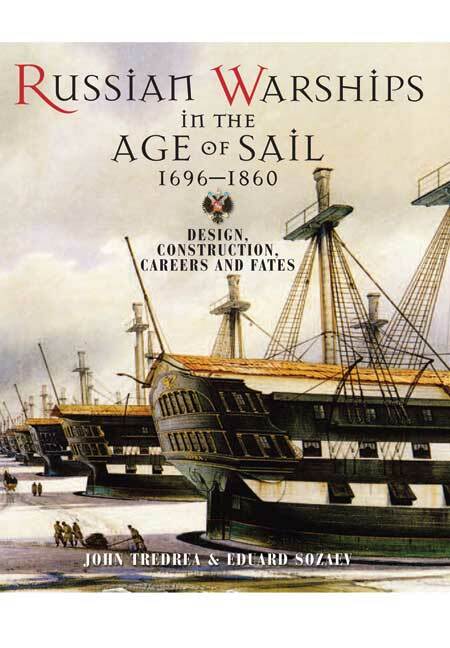 Russian Warships in more for the naval historian than the modeler, but if you have an interest in the Russian sailing navy, this is a must-get book. This is a comprehensive and truly signficant, work on Russia's various fleets in the pre-steam days, encompassing a broad amount of detail, from ship types and inventories to shipyards and inventories to shipyards and bases, naval ordnance and administration. It is an impressive book, the result of a collaboration between a Russian naval historian and expert on the warships in the Age of Sail (Sozaev) and American researcher and writer Tredrea, whose efforts facilitated the English language publication. It makes a credible effort at supplying design history, construction profile, career 'biography' fate and every vessel in Russian fleet from 1996 to 1860, yet not all are complete. Vessel names are indexed and details are listed in the tables, which are supported throughout by many fine line drawings and throughout the book is amply illustrated by drawings and paintings. Though reproduced in black and white, they are of high quality. There is much more here than ship details - for we have interesting accounts of how Peter the Great founded the Russian Navy with help from the Dutch as well as the British. Tsar Peter sent his shipbuilders to Plymouth, Portsmouth and Chatham, to study working practice and copy plans. Later, British shipwrights built ships in Russia and British naval officers, the majority Scottish or Irish, served in the Russian Navy during Peter's reign. By the time of the Russo-Turkish War of 1768-74., those commanding in the Russian Navy were mostly of British origin but the great need for qualified officer material led to the recruitment of the American John Paul Jones. However, as this book reveals, Jones' presence was a source of friction between himself and British officers, who regarded him as a pirate and traitor.